Alcohol is a general term denoting a family of organic chemicals with common properties. Members of this family include ethanol, methanol, isopropanol, and others. This introduction discusses the physical, chemical, and physiological aspects of the most commonly ingested of these ethanol. Alcohol (ethanol) is a clear, volatile liquid that burns (oxidizes) easily. It has a slight, characteristic odor and is very soluble in water. Alcohol is an organic compound composed of carbon, oxygen, and hydrogen; its chemical formula is C2H5OH. Alcohol is a central nervous system depressant and the central nervous system is the bodily system that is most severely affected by alcohol (see chart on right). The degree to which the central nervous system function is impaired is directly proportional to the concentration of alcohol in the blood. When ingested, alcohol passes from the stomach into the small intestine, where it is rapidly absorbed into the blood and distributed throughout the body. Because it is distributed so quickly and thoroughly, the alcohol can affect the central nervous system even in small concentrations. In low concentrations, alcohol reduces inhibitions. As blood alcohol concentration increases, a person’s response to stimuli decreases markedly, speech becomes slurred, and he or she becomes unsteady and has trouble walking. With very high concentrations – greater than 0.35 grams/100 milliliters of blood (equivalent to 0.35 grams/210 liters of breath ) – a person can become comatose and die. 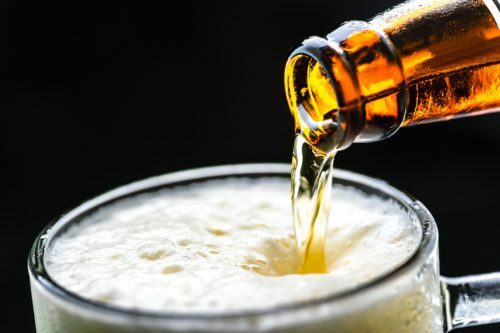 The American Medical Association has defined the blood alcohol concentration level of impairment for all people to be 0.04 grams/100 milliliters of blood (equivalent to .04 grams/210 liters of breath). On the following pages is a generally accepted guide to the effects of alcohol. This includes absorption, distribution and elimination of alcohol in the body. Many things can have an effect on BAC, they include body weight and body type, rate of consumption, alcohol content, food, medication, fatigue, tolerance and gender. The following is a generally accepted guide to the effects of alcohol.